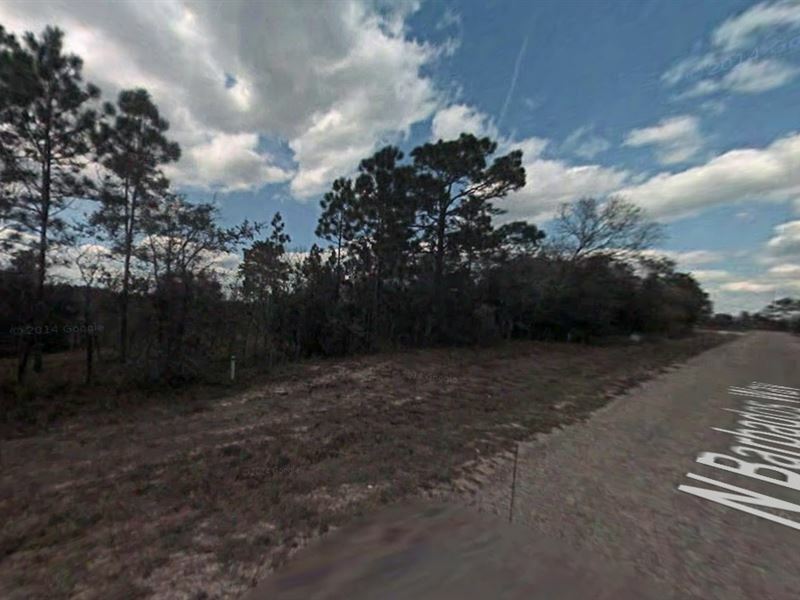 Beautiful Lot For Sale IN Citrus Springs This lot is a gorgeous place to build a dream home, vacation get away, or even a great investment. This property has amenities available, road access, and ready to build. Move to Florida today and enjoy the beautiful sunshine state. Citrus Springs offers the feeling of open space and closeness to nature on a more affordable budget. The lots and the homes in Citrus Springs are more modest than the nearby Pine Ridge Estates. The Citrus Springs area is enormous and still largely undeveloped with several hundreds of vacant lots, many of which are for sale. There are sections with more dense development for a more neighborhood feel or you can buy in more sparsely developed sections for greater privacy. In almost any direction you look in Citrus Springs, you will see unspoiled wooded areas and all that nature has too offer. Local wildlife include, eagles, red tail hawks, owls, squirrels, tortoise, fox, and raccoons among others. If you are a nature lover, you will enjoy the sight an sounds of just relaxing in the backyard. A Citrus Springs home is perfect as a starter home for a new family or a retired couple looking to down size and return to a slower, less hectic pace. Many activities are offered to the residents through the Citrus Springs Community Center and the surrounding area offers endless outdoor recreation. Citrus Springs offers only a short drive east to Inverness and the Tsala Apopka Lake Chain. The lakes of Inverness offer excellent Bass fishing and pleasure boat recreation, including airboat tours. Just to the west is the Gulf of Mexico via Kings Bay, another boating and recreation hot spot with thrilling, saltwater sport fishing out in the gulf. Situated in the northern part of Citrus County, Citrus Springs is also close to Dunnellon, Rainbow Springs and the larger metropolitan area Ocala, Florida. Dunnellon offers much to the outdoorsman, the Withlacoochee River and the Rainbow River meet here for unsurpassed fishing tales. The Rainbow River is a popular canoe and kayak location, taking you back to the days of yesteryear and old Florida, untouched by development. Ocala Florida is a much larger city just twenty minutes up the road from Citrus Springs. Vibrant Ocala offers the entertainment and excitement you would expect from a cosmopolitan city. If you want to be right in the middle of it all, Citrus Springs may be the place for you. 8852 N Barbados Way This lot on 8852 N Barbados Way has easy paved road access and located in developing zone of Citrus Springs. There is already one house along Barbados street. Nearby schools include Citrus Springs Elementary School, Citrus Springs Middle School, Central Ridge Elementary School. Nearby cities Ocala, FL - 29 miles, Spring Hill, FL - 36 miles, Leesburg, FL - 47 miles, Gainesville, FL - 50 miles, Tavares, FL - 57 miles. Things to do golf, swimming, boating, hiking, dining, horseback riding, shopping, ocean, fishing. Utilities Water available in area Electricity available in area Septic required Please contact County Property Assessor's office for additional information. Phone number tel Size 0.23 acres Legal Description Citrus Springs Unit 6 PB 6 PG 15 Lot 14 BLK 571 Taxes Buyer will be responsible for current year's tax and all future taxes. Tax is subject to change. Call tax office to recheck We did not see the property. Please do your due diligence.